The Windows version of Google Chrome was launched in September 2008 and many users asked for Mac and Linux versions. The work to port the Windows version started soon after the initial release and it will soon show some visible results. 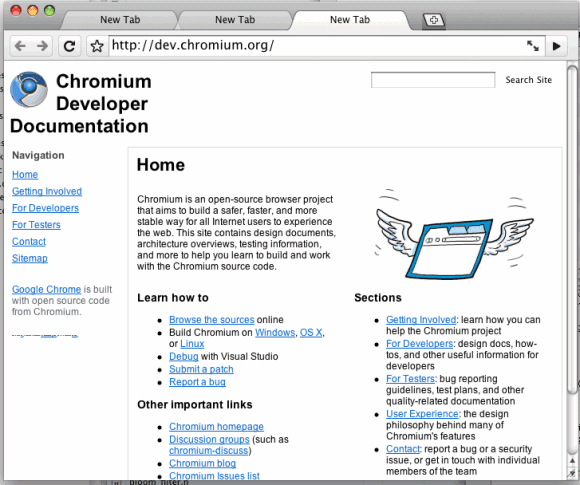 A document from Chromium's site includes a list of remaining features that need to be implemented. "The purpose of this document is to help organize and coordinate the effort to get a browser window up and running on Mac and Linux using as much of the code that is already there as possible (with temporary header and link scaffolding, plus ifdefs) as opposed to writing a bunch of throw-away code that duplicates what already exists on windows. Our goal is to get a double-clickable app with a working browser window using the real multi-process infrastructure (not TestShell) by mid-February." Mike Pinkerton offers more details about the Mac port, which will certainly be released before the Linux version. "We made a list early in the week of the key classes on the critical path to getting a renderer launching and showing bits on the screen. Our goal was to have a renderer being spawned by launching the browser by the end of this week. The list is now almost all green and as of this morning we hit our goal (one day early!) to have renderer processes launched. In fact, we launch a new renderer with each tab, and when the tab is closed, the renderer goes away!! You can see it come and go in Activity Monitory. All this goes through the cross-platform infrastructure with a Cocoa front-end." And another screenshot via Mike Pinkerton: "Now mind you, clicking doesn't work, and the renderers crash like nobody's business, but the other great thing is that the user interface stays running even if they do. Just open a new tab and keep going! It's important to point out that's part of what's taken us so long to get to this point. The WebKit that ships as part of Mac OS X can't run this way -- it took a lot of work to marshall it to do so. In addition, the UI clearly needs much love, but it's an indicator of the clean and simple direction we're heading." * Mac Detailed Status: "Our new goal is to have a multi-process browser limping by the end of the quarter." * Build instructions: "Right now, the Mac build is a work in progress. The TestShell project builds and is able to render web pages, and this area is currently under active development, but work has yet to begin on the user interface of the main Chromium application." @Anonymous - Don't want to start a "war" or anything like that, but have you seen iTunes and QuickTime on Windows? I know Apple follows Windows UI standards, so I totally understand your displeasure at Google not following Apple's UI standard. Anyway, that New Tab button looks awful, but what do I care? I use Windows and IE8 RC1 -- though I am thinking of making Chrome be backup browser once it is more feature-rich. Good thing it isn't blue. Pretty sure the new tab button won't stay that way. I don't see anything that violates Apple's UI guidelines. I just noticed the Chrome sad face looks just like the old Apple sad face. I am a Linux user of many years. Linux as an operating system with many fine GUI's has come of age. I am using Mandriva 2009 and Ubuntu 8.04 in a dual boot. I can't say which I enjoy more. I, and the rest of the Linux world looks forward to a new browser. Firefox is excellent. It's children, Seamonkey and Galeon all offer something different. I am looking forward to Chrome on Linux. I hope it comes sometime soon. I understand that this software is at an early stage of development so I am not focused too much on how it looks right now. I bet it will look quite different by release. I am quite excited about Chrome on Mac. Although I consider myself a Mac purest who normally chooses Apple software over most other offerings I now use Chrome on Windows at work as my preferred browser and I want the same browser experience at home on my Mac. I agree with Derek. I've set Chrome as my default browser at work as well. There's something hypnotically appealing to having a lack of user interface and quick quick quick access to the web. While I generally use Safari on my Mac at home, I'm really looking forward to using Chrome upon its release! functional with Safari. I'm hoping that Chrome will solve that problem. @Anonymous, if you had actually read Pinkerton's blog, he points out that the UI isn't finished. Google knows it doesn't look good yet! "there's still some work for creating a proper user interface"
Keep in mind before posting. I'm glad they didn't keep the blue color interface, and I hope that the final UI will try to follow the standards alittle better. I just want a fast web browser and since i tried it on my windows mac (bootcamp) i know that it'll be great! Keep up the good work and i look forward to runt it in leopard! All the whiners who are bitching about Apple's UI standards - get a life. This is a free country, and every single developer/company have the right to do...quite frankly...whatever they want. Yes, it's annoying to have non standard UI at times (i.e. how do I do this in Chrome?..because in Safari and Firefox...I can do it this way). If you strictly comply with standards, you don't have originality, and without originality there won't be innovation. My two cents, and peace. It looks fake.. as if it were a skin. Yo, as long as the UI looks nicer/works better than Firefox for Mac (I still wonder why I can only move a Firefox window by clicking and dragging on the title bar), then I'm sold. Where do I sign? Consistency is important, I suppose even more so for mac users. Arguments on consistency aside, this absolutely is one of the best interface designs I have seen in a long time. Excellent! Looking forward to using it on my iMac. This screenshot is fake. It's only skinned Firefox, I can say by pixels. And look at that shadow, definitely photoshopped. Yes, Chrome developers have nothing better to do than photoshop screenshots. Well I won't come down too hard on them for what a first stab looks like. After all they have to start from somewhere. I'm sure it has probably looked a lot worse during its development because no one has had to look at it but them. I get the feeling they will probably put some "Pretty" on it eventually. At least I sincerely hope they do. To the person up there telling people who are upset about the UI to get a life. I say here is one cent change back for the opinion. Thanks! One of the reasons us Mac users like OS X (besides stability) is because of the consistent user experience. Would you buy a car with a horrible looking exterior and inconsistent driving interface to what you are use too? Probably not! Would you tolerate someone simply telling you to get a life when you protested? Probably not. Granted you are PAYING for a car I think you get my drift. As it looks now Chrome would have to be one speedy MoFo on the Mac for me to have it installed on my system. So agreed, it looks terrible now, but give the guys and gals chance to release something to the public before we start judging it as though it's a completed product. We have no idea what stage of development this application is in. I personally hope that the little (+) button works like it is supposed to do on a Mac, this really pisses me off with FireFox! 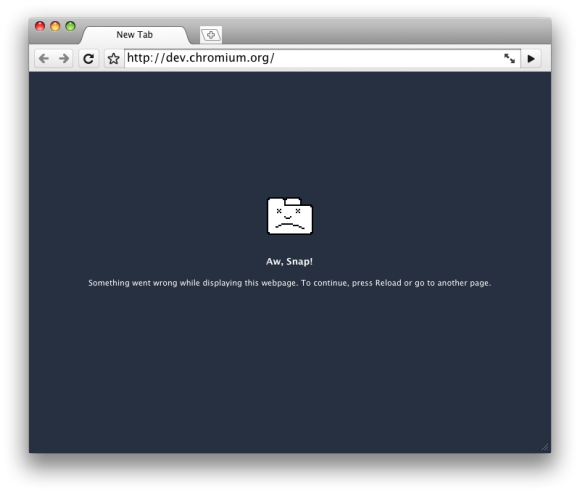 I can't wait for Chrome on OS X! It's by far my favourite browser on Windows. It the interface is kept as clean and pixel-perfect as it is on Windows, it might have a better interface than Apple's own apps. I would love if there was a button on the window to return to the tab page. I use the equivalent button on Safari 4 all the time to close the last tab without losing the window. Safari mobile is also getting a similar feature on the iPhone OS 3.0. Well, everybody seems to think that all this is good news. I have to admit: As much as i am fan of Google applications and -ideas... why the HELL does that take so long? Google is a HUGE company, and the Windows-Chrome is simply great. I am using it on my Windows-machines, but really: Switching back to Firefox everytime i use the Mac makes me angry. thanks for give me wonderful information.I think it looks alot nicer than the windows version. please port this theme to windows.